Here’s what you can do to help—Be Heard! Comment Deadline is February 24, 2017. 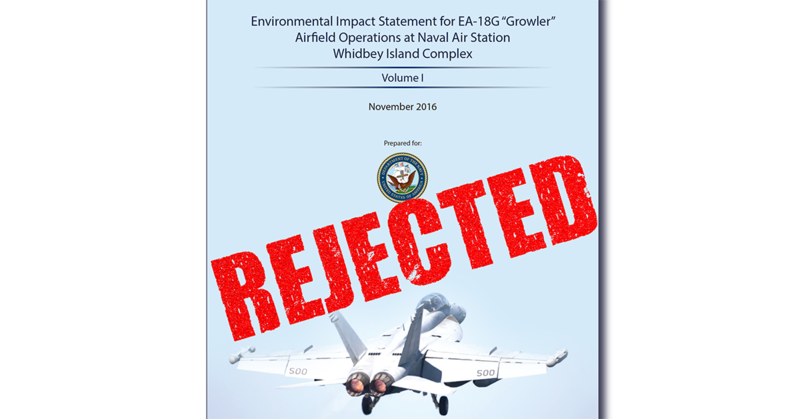 The DEIS did not comply with the National Environmental Policy Act (NEPA) by failing to judiciously examine off-Whidbey Island sites to conduct flight carrier land practice (FCLP). The annual Day-Night Noise Level (DNL) noise contours depicted in the DEIS are misleading and fallacious for two reasons: (1) inappropriate use of 365-day averaging rather busy-day averaging, and (2) holding up as scientifically valid an outdated, misleading, and scientifically invalidated DNL threshold for high noise annoyance. The DEIS claim that the JGL noise study was “flawed” is disingenuous and unsupportable, whereas in actuality the Wyle modeled noise levels have not been validated with on-site noise data. The DEIS misconstrued important finding of the National Park Service’s 2015 noise study at Ebey’s Landing Historic National Reserve and obfuscated forthright analysis of the impacts on visitor experience. That misconstruction has to be credibly revised to properly characterize the real impacts. Much like the tobacco industry did years ago, the DEIS selectively and reprehensively cites and relies on out-of-date medical research findings on impacts of noise on human health that are at odds with the overwhelming body of contemporary research. This obfuscation renders the DEIS findings incomplete and disingenuous and demands an honest, complete, forthright evaluation of the contemporary formal medical literature. The Navy has adopted standards that protect their personnel from health and hearing harm due to excessive noise, yet these standards were ignored by the DEIS for civilians exposed to the same or greater levels of noise. This DEIS needs to examine how many civilians would receive exposure doses that exceed the Navy’s defined “hazardous noise zone” threshold (i.e., an area where the 8-hour time-weighted average exceeds 84 dBA [or 140 dB peak sound pressure level, SPL, for impact or impulse noise] for more than 2 days in any month). Island County has unconscionably ignored the Navy’s 2005 AICUZ land-use directives for Outlying Field Coupeville, especially as reflected by construction permits issued in Noise Zone 2 areas, where the AICUZ stipulates no residences should occur, as well as other land uses. Whether due to the County’s willful intent to ignore or due to lack of Navy assertiveness, it aptly demonstrates the meaningless and ineffectiveness of the AICUZ and similar land-use provisions in the DEIS. Given the alternatives under consideration in the DEIS, the Navy should immediately advocate that the County place a moratorium on all construction permits not compatible with the 2005 AICUZ and DEIS land-use stipulations until the final EIS is approved. The two most dangerous aspects of flying are the approach, landing and takeoff — in other words most of the OLFC flight path. The risks are significant (a) because of unrestrained and major encroachment problems, (b) because OLFC is about 49,000 acres below and the runway about 3000 feet short of FCLP standard for Growlers, (c) because the pilots are mostly students flying the F-18 airframe which is 5.5 times more likely to crash than its EA-6B (Prowler) predecessor, and (d) FCLP operations occur at low elevations that increase likelihood of bird strikes exacerbated by the significant shoreline bird population. These risks cannot be mitigated other than by moving the FCLPs to a suitable 21st century off-Whidbey site. Environmental Justice analysis overlooked the fact that farm workers, gardeners, and recycle center workers are almost entirely composed of low-income and/or ethnic minorities, and because they must work outside, they are disproportionately affected by overhead Growler noise. Perfluoroalkyl substances (PFAS) have been discovered in numerous wells adjacent to OLFC and are believed attributable to fire-retardant foam use at OLFC. The DEIS, however, dismissed addressing the related past, present, and future impacts and problems associated with PFAS, even though the EPA has set a Health Advisory that has been exceeded by 16-fold in some of the impacted wells. Leakage of PFAS in storage or their use in a crash event is a hugely relevant environmental impact that must be addressed. And the public must be given the opportunity to comment. The DEIS noise levels were based on about 30% of the proposed 8800 to 35,000+ operations at OLFC being conducted on Path 14. Since 2013, when the transition to Growlers was relatively complete, the highest use of Path 14 has been about 2 to 10% because, as base commander Captain Nortier explained Growlers are only rarely capable of using Path 14. The DEIS 30% use projection of path 14 greatly understates the DNL noise impacts for path 32 and overstates the impacts on Path 14. This mistake must be corrected. The DEIS fails to address the potential effects of sleep disturbance due to Growler overflights, despite the admission that there will be an increase in the “percent probability of awakening for all scenarios…” While music torture is still permitted under US law, the United National Convention against Torture defines torture as “any act by which severe pain of suffering, whether physical or mental…” Sleep disturbance results in serious physical and emotional symptoms such as cognitive impairment, impaired immune system, adverse birth outcomes, risk of heart disease, risk of diabetes, not mentioning the number of work hours/days lost from lack of sleep. The DEIS must forthrightly address the impacts of sleep disturbance on residences affected by OLFC night operations. The DEIS obfuscates the effects of FCLP jet noise on classroom interruptions by averaging interruptions with periods when jets are not practicing. The average understates interruption events compared with event frequency during FCLP sessions, which are as frequent as an interruption every 1-2 minutes. Interruptions of such frequency complicate teaching and thwart student concentration and break the focus of teacher and student. In addition the EPA states, “Noise can pose a serious threat to a child’s physical and psychological health, including learning and behavior,” but the DEIS has not recognized the contemporary research. These oversights and failings must be properly addressed and reanalyzed. The DEIS fails to address the effects of noise on hearing and tinnitus and consequential medical costs associated with hearing loss by stating that civilians would need to be exposed to noise emitted by the Growlers for 40 years before there is a permanent shift in hearing. This defies all scientific and audiological evidence to the contrary, even by the US military itself. Hearing loss and tinnitus are the MOST compensated injuries in the military and increasing annually (US Dept. of Veteran Affairs.) That and failure to address the effects of impact or sudden noise must be more fully delineated. The DEIS fails to adequately address the effects of high noise levels during pregnancy that provoke significantly higher risk for smaller newborns, gestational hypertension, cognitive abnormalities, and permanent hearing loss. The DEIS does not address the issue of sleep deprivation in the Ebey Landing area. I have spent nights lying in fear of a low flying plane crashing over me in the Eby landing area. The noise id deafening and it goes on for hours , many nights in row. This has got to affect children, adults and domestic as well as wild animals. Please update first step to have link http://whidbeyeis.com/Comment.aspx open in a new tab or window, making it easier to follow instructions. Thank you for putting together easy instructions for citizen action. I’m out in Port Angeles and feel angst every time I hear a Growler fly over. I can’t even imagine how folks closer to Whidbey Island are surviving. This Navy plan to train aircraft personnel and do air warfare exercises over and around Whidbey Is. is extremely dangerous to its civilian population, to say nothing of the wildlife on, over and around Whidbey Is., as well as Naval personnel. This plan is a disaster in the making, and must be stopped until it is revised to meet the safety and environmental stipulations below in the final EIS, and/or be moved to where these EIS provisions can be met.